The 1964 MPC Triceratops is one of the better Dinosaur toys. The MPC Triceratops is Really Quite Nice... Honest! 1964 saw the release the of the twenty-four MPC Dinosaur toys in a toy tsunami. 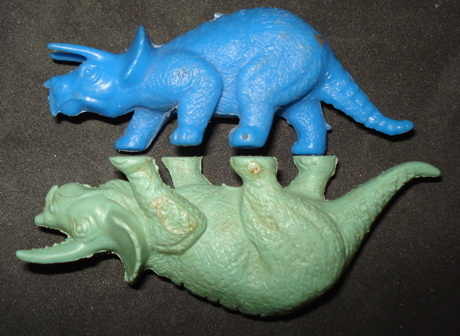 These were created to take advantage of the Dinosaur toys market that the Louis Marx toy company had opened in 1955. They came in a great variety of bright, plastic colors (fire-engine red, bright yellow and green, blues [metallic and otherwise], grays and browns) and range of quality. Some were particularly good (the MPC Triceratops, Struthiomimus and Diatryma) others bordered on miserable (their Cynognathus comes to mind) and still others were extraordinarily unique (the Cerotogaulus). 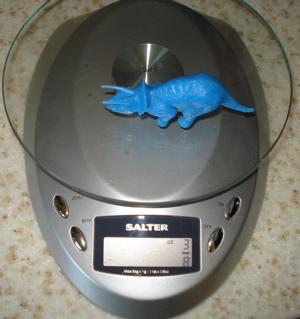 This Triceratops is rather a lightweight, weighing in at three-eighths of an ounce (.375 oz, 11 gms) it measures three and a half inches (3.5", 9 cms) in length making it, by its own devise, about 1/68.5 scale. Eighteen of the twenty-four (I am not including the Brontosaurus because it is an original [if poor] sculpt.) MPC figures are quite clearly lower quality copies of the Marx Dinosaur toys. Now, certainly, Marx had already done most of the better known Dinosaurs at the time but MPC could have shown more originality in postures as they did in six of their figures (the Brontosaurus, Cerotogaulus, Diatryma, Dire Wolf, Glyptodont and Macruchenia). However this MPC Triceratops is not only (perhaps) the best made of all the MPC Dinosaurs but it also meets all of my basic requirements for a Dinosaur toy. This little guy is sculpted in a straight line. He is looking forward and has very little animation in his posture. He can go straight ahead, left or right with equal alacrity. He can quietly graze, migrate or face down hungry predatoys. Below we see a herd of MPC Triceratops facing down a pair of dread MPC Grapeosaurus Rex. It's all up to you and your imagination. Okay. So I like Dinosaur toys that do and are doing nothing. Or at least as little as possible. These are, in my experience, crisply cast without much "flash" and are still in great shape even after thirty or forty years of continuous playtime. These are serious little Dinosaur toys. 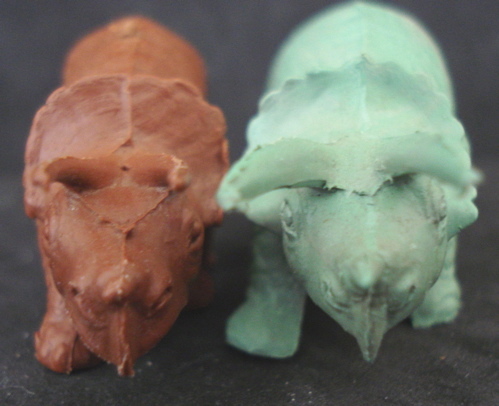 As you can see (right) the MPC Triceratops is well sculpted and looks very, well, Ticeratopsian. It is nicely muscled and looks like a powerful little fellow. Here is a closer look. 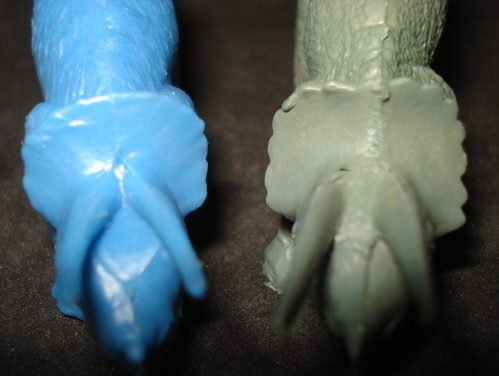 The texture detail of the skin on these Triceratops figures looks a lot like the surface of an iced-over pond. Pretty cool. The imprints on the tail indicating the name and size are on opposite sides from that of the Marx Triceratops (see below). Above, the herd hangs out in peace. Below, the mighty Marx Allosaurus finds the MPC Triceratops herd a formidable opponent. No easy lunch here! 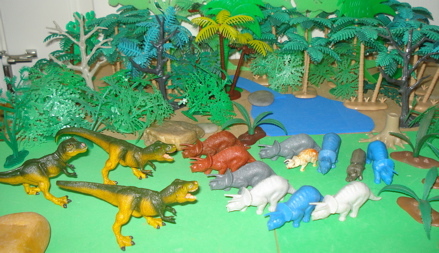 Today we find the contemporary Triceratops (photo below) as presented by PAPO (rear left), Bullyland (rear right), Carnegie (middle left), Wild Safari (middle right), and Schleich (right front) as compared to the little brown MPC Triceratops to be quite actively posed, highly detailed, and, if inanimate, still busy. While all these current Triceratops iterations are well done, some spectacularly so, and significantly larger than their pocket-sized predecessor, are they truly, in fact that much better? These are, after all, toys, and meant to be played with. Undoubtedly the detail on the MPC Triceratops would look awfully crude on a 1/30 figure such as the PAPO Triceratops but, at the same time, the very lack of action in the MPC figure inspires the imagination without directing it. Below we see the Jurassic Park, 1993 Triceratops in comparison to the MARX (Green) and MPC Triceratops. Certainly the size difference is extreme. The detail is nearly equivalent, given relative size, and yes, I know that the JP figure is an "action figure"....But LOOK at it! It is in virtually the same posture as the MPC Triceratops! What a great toy. Apart from the minimal "action" it offers (the head raises) it is in an otherwise neutral pose. I just like that. I have asserted that the MPC Triceratops is a copy (imperfect) of the Marx figure. While I don't think most collectors would disagree with this let's take A close look at these, side by side. 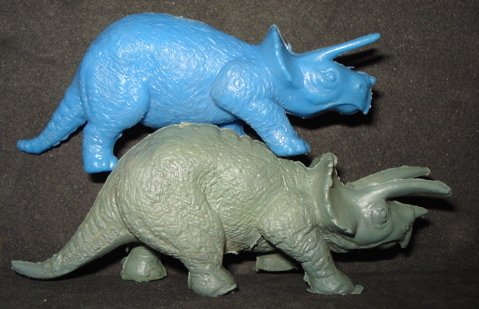 Above we see the MPC Triceratops (blue, on left) face to face with the Marx Triceratops. Given that the Marx has one third more plastic (.5 vs .375 ounce) the size as well as detail difference is quite visible. The nose horn, beak and frill, as well as the entire head itself, are larger and more distinct. 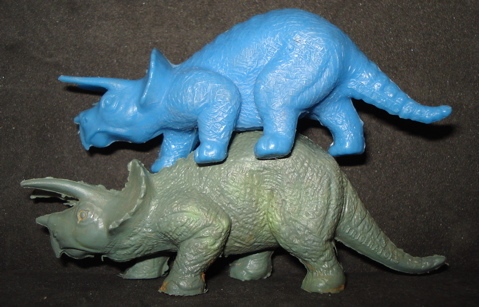 The horns of the MPC Triceratops are straight while those on the Marx are curved. Marx wanted their figures to appear "natural" and produced them (at least initially) in 'earth tones'. MPC produced their series largely in bright, un-natural toy-like colors as can be seen in the above comparison. 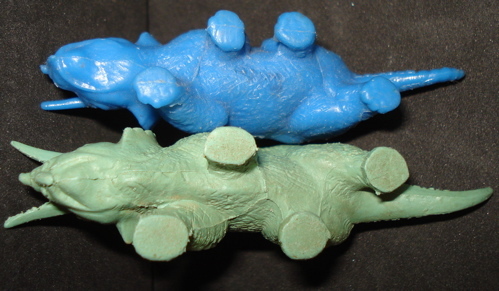 Below we see the heads of our Triceratops (the MPC are the blue and the brown) from another angle. Below- Even the mighty Marx 'sleek' T-Rex finds the formidable phalanx of the MPC Triceratops herd to be a sharp rejoinder of their luncheon lust. "Go away. Get the point?" 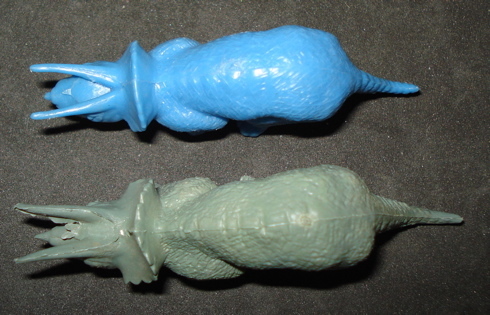 A side by side comparison (above, MPC Triceratops in bright blue) shows clearly the size difference as well as the depth of detailing. The skin of the MPC Triceratops has been described (by me, earlier on the page) as having the texture of an iced-over pond, a melange of short, criss-crossing lines laid upon a flat surface. The Marx Triceratops has a lot more going on in its detail and texture. It is more heavily limbed, more muscular with sharper and more depthful detail in every way. or looking up from below (above) the differences and similarities quite clear. Even the 2004 Safari "SUE" T-Rex finds itself unable to pierce the "Great Wall of MPC Triceratops". "But they come with their own fork and tooth picks." While I don't like these as much as the Marx I do like them well enough and have nine of these myself. I have made no particular effort to purchase them, having a few from my childhood and the rest were picked up via eBay as part of large "lots" of other Dinosaur toys. I do not collect these (on purpose) myself but there are those (whom I still respect highly) who do. 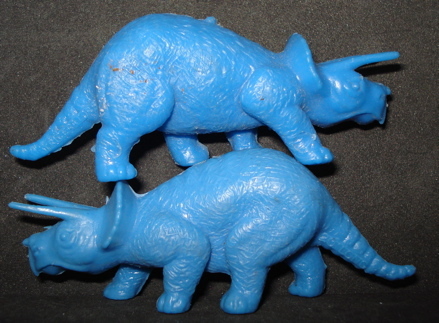 They are collectibles and are an essential part of the history of Dinosaur toys. 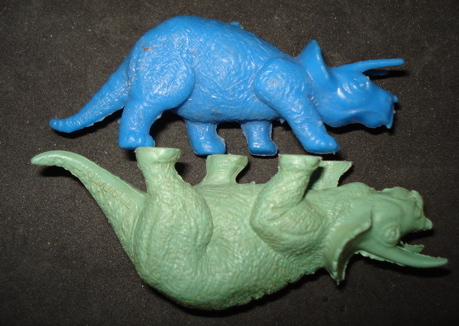 If I were going to collect MPC Dinosaur toys, these MPC Triceratops are the ones I would. They make fine additions to my herds of Marx Triceratops, serving as older juveniles/sub-adults. They are also less expensive to acquire, even today, and my average cost has been $1.02. Just be careful when buying these because ill-informed sellers will sell them as the more valuable Marx figures. The MPC Triceratops have straight, pole-like horns, very small beak and nose horn and a small frill on which the scalloping does not particularly stand-out. Despite being considerably smaller you cannot tell that when all you see is the Triceratops standing on its own. These were produced back when first, only Marx was making plastic Dinosaur toys, and then, when MPC got into the business they didn't mind if their product was mistaken for Marx. Consequently the only imprinting on these is the Dinosaur name and its length. No manufacturer name. Also no "CE" as these predate the European Union although not quite predating initial Government scares about lead in plastic toys. They may or may not contain lead. I'm not spending $10,000.00 to have them tested (and destroyed in the process) so I will just keep them away from the grandchildren. "No tail chewing Dino-babe!" (or Dino-pup, either.) On the other hand these have been played with for over forty years without apparent toxic consequence. As an official disclaimer these are vintage collectibles, no longer toys. This is the MPC Triceratops page. Click here to return to our main Triceratops page, thank you.